...In other words, as I always seem to be implying, fruit tarts to make a liiiiiitle before now. Or, tarts with strawberries and/or rhubarb of some sorts. After two installments of what I started as the "fruit tarts to make now" series in editions Autumn and Winter, I fully intend on posting you what should obviously follow - Spring. Hopefully while it is still, well, spring. As I write this I've got all the photos sorted out, but haven't got enough time to do the writing bit, not for another week or so. I know, I know, who wants to think about the damp and cold when it is in reality warm and glorious out? But if you can see it in your mind's eye. Early March is still very much winter than anything else up here in the mountains. That said, the snow that's stuck around for months on end is finally starting to melt, gradually exposing the grounds. Also, the quality of the snow changes too. It tends to be light and powdery in the deep of winter because the air is fairly dry. As the warmer weather approaches, so does the humidity which makes the snow wetter and heavier. Also, it melts more quickly. That's how we sense the advent of spring, even when it is all white out. From the months of January through March or even April, our local green markets are all but closed with very little on the shelves. All you may find would be dried foods, root vegetables, and perhaps apples. Even when the temperatures start going up and the day growing longer, spring seems to be still far off as far as fresh produce is concerned. So all in all, we mostly eat the remains of winter fruits for a little while longer. Such as citrus fruit, for instance. Although citrus are around more or less all year around thanks to the imports, their season is predominantly winter. I made a lot of citrus fruit tarts in winter, and have kept making still more in the early spring using whatever is left of them. First on the list: lemons. I think this lemon tart is distinctly more springlike than wintery, not simply because it's got fresh strawberries on it, but also it uses lemon thyme. It's one of the many joys of spring to go to garden shops and pick up herb plants, even though little can survive in our shady and damp corner of the woods. Anyways, lemon thyme and yogurt tart. I made this based on a recipe from Flavor Flours: A New Way to Bake with Teff, Buckwheat, Sorghum, Other Whole & Ancient Grains, Nuts & Non-Wheat Flours by Alice Medrich (Artisan, 2014). It is originally for yogurt tart, with a crust made using oat and rice flours, filled with a mixture of Greek-style yogurt, sugar and eggs. Here I took Greek-style yogurt and drained it further of fluid, and replaced it with the equal amount of juice of lemon, together with grated zest for good measure, to make a lemon-flavored filling. I also added chopped fresh lemon thyme leaves. The result was a most refreshing and light thing, with the fresh strawberries adding another layer of freshness factor as well as the colors. Meyer lemon tartlets. The recipe is from Love, Eric Revised: Delicious Vegan Macrobiotic Desserts by Eric Lechasseur (Japanese ed. translated by Natsuko Sakai and Sanae Suzuki, Parco Publishing, 2007). It happens to be a macrobiotic recipe that uses amazake to sweeten a mouth-puckeringly tart lemon filling. Although I'd made these before (don't seem to have posted about it here though...), here I had a trouble with the crust, and messed up two batches (urgh). In the end, I used another crust recipe and it worked out alright to my great relief. While lemons are around all year round, the same cannot be said of the yuzu. Yuzu and mint tart with coconut. Of all kinds of citrus fruit, yuzu represents winter the most to me. The last yuzu I had from the winter was here paired with fresh mint, which carries a whiff of the warm weather around it. I employed basically the same tactics in making this as I did for the yuzu tart I wrote about in the winter fruit tart post, which was a version of lemon squares; just bake it in a tart pan. I liked the (mostly) vegan one I used last time, but here I looked around for some other new recipes, and settled on this. It is free from wheat flour, refined sugar, and dairy although it does use eggs. And coconut, a plenty of it too. I swapped the lemon for yuzu, and added grated zest of yuzu and finely chopped fresh mint leaves in both the crust and the filling. It was even dusted with coconut flour! Not surprisingly when you see how much coconut that goes in the tart, the dominant flavor of it was coconut. I think I could have used a little more yuzu and mint, but the flavors played out really well all the same. Even though, it was more of a cross between winter and summer than spring itself, if you know what I mean. As the yuzu makes an exit, arrives amanatsu - another one of Japanese citrus fruit. These amanatsu tartlets consisted of a simple sable cookie shell, baked with a cream cheese-based mixture in them, then filled with an amanatsu curd and topped with pillowy whipped cream. I think it's safe to say that this was one of the more elaborate recipes I ever make, but the result was well worth the trouble. The recipe can be found here (in Japanese). Even here in Japan you don't see too many amanatsu-based sweets outside of jams and gelatin desserts. Maybe I should try possibilities beyond those! And now, one of the most versatile citrus fruits - oranges. Once found almost exclusively imported, oranges are increasingly more widely available domestically-grown in this country, which I think is great. This fresh orange tart with strawberry yogurt was a reincarnation of the fresh orange tart I'd made this past winter. We enjoyed it so much I wanted to make it again while oranges were still around. The recipe is from here, and I replaced a portion of the yogurt with pureed strawberries. The addition of strawberries tinted the yogurt filling faintly pink, although you can't very well see it with all the orange slices covering the entire surface of the tart. ...Well, you can't really see that even with it sliced up, either, in pictures - but I assure you it really was pretty pink! Here I used two kinds of oranges, namely Navel and blood, instead of three with the first one. But the tart came out gorgeous and tasty again. Another one with the two types of oranges plus strawberries... ...Although, I can't really say this one here was just as pretty, I'm afraid. I set about the topping part with little idea of how to go with it, and ended it still not knowing what I was doing. The result was this rather haphazard-looking strawberry orange tart. Sigh. I used this recipe, and replaced spelt instead of regular wheat flour, mascarpone rather than Neufchatel, and added some grated zest and juice of an orange. It wasn't much to look at, but did taste fine! Honest!! Here's another one that featured blood oranges, in a form of blood orange sablés Bretons with mascarpone and pistachios. Sable Breton is a slightly cake-y cookie hailing from the Breton region in France, renown for their superb dairy products such as cream and butter. It is usually made with salted butter - and a plenty of it, too. You can find these salty-buttery-all-round-rich cookies in Japan, both imported and domestically made. But not so often in a way, as it is here, paired with fresh fruits and served as a tart. I think I first came across it in this book. Here I used this recipe, which adorns the sable with tart-sweet blood orange segments and a cloud-like mascarpone-based cream. Sable Breton makes a quite soft dough, and is usually baked in tart rings to hold shapes. Now I don't own tart rings that were good for this purpose, but I refused to be deterred by that and just baked them in a muffin pan. ...Which probably explains why my sable Bretons looked rather like cupcakes, especially with all the cream on top... Both the sable 'crust' and the cream were rich with butter and cream, respectively, but the finished tarts managed to taste extremely light and went down very easy - too easy, even! This winter, by the way I went to town on produced-in-Japan oranges (and other citrus fruits). I wasn't in a full-on candied peel or marmalade making mode, but I did make something sort of like candied slices - but in honey (like these). Here's a tart that used some of them: I made a rye tart dough from the recipe in this book, rolled it out, sprinkled with some bread crumb, then piled the honeyed orange slices on it along with chopped rhubarb. Off it went into the oven and came out as an orange rhubarb galette. Easy! Now, as April rolls around, the persistent snow finally melts, and gets replaced by a hint of green that starts showing on the grounds and on the trees. For a few weeks from March to April, the mountains tend to be all in brown - not the glorious kind of brown like in Autumn but a dull, monotonous one. So any signs of new greens, however faint, make my heart dance with joy. As I've already said, sights of green come a little later at our local green markets, and the absence of fruits are especially conspicuous (except perhaps for languishing apples). This year, I was totally thrilled to find rhubarb at our local market towards the end of April. You find fresh rhubarb a lot here in Nagano, but they usually come around in early summer and in autumn. This may have been the earliest in the year I saw them sold at the market. Then, in early May, I came across a properly rosy red specimens, which are really, really hard to come by; most of rhubarb you see here are half (or more than half) green. I am still totally happy to bake with green rhubarb, but the red ones do make your sweets definitely prettier. Green or red, rhubarb is one of the very few fresh fruits (ok, it is really a vegetable... but still) that are around in early spring, so I tend to bake a lot of things with it, including, yes, tarts. Honey rhubarb tarts with ginger and brown sugar yogurt. This is a kind of things I'd always wanted to make should I lay my hand on thin, ruby-red stalks; and I finally did! hooray! And this one was pretty simple to make, which was like a bonus. All you need to do is roll out a piece of (store-bought) puff pastry, place stalks of rhubarb on top, drizzle with honey, and bake. While the tart bakes, add a bit of grated fresh ginger, vanilla beans, and brown sugar to some Greek-style yogurt. So simple, and so good. I've as good as written it down, but you can find the original recipe here. Rhubarb and almond tart. A sheet of puff pastry spread with almond cream and topped with pieces of rhubarb that have been soaked in a rose- and vanilla-flavored syrup before it goes into the oven. The recipe calls for store-bought puff pastry, but I had, on a whim, just made a batch on my own, so that was what I used here. Mind you, it was not the proper, folding a sheet of butter in a flour dough kind, but a simplified version (so-called rough puff) - but I think it worked perfectly fine for this kind of pastries. The recipe is from Annie Rigg's new book Summer Berries & Autumn Fruits: 120 Sensational Sweet & Savoury Recipes (Kyle Books, 2015). This was the first recipe I tried from this beautiful book, and it wasn't until I started making the tart that I realized I was making the cover recipe. (Incidentally, the second recipe I tried happened to be the one of the back cover. Funny how these things happen....) A simple and gorgeous tart at any rate. While I love how red rhubarb make the prettiest pink pies and puddings, red ones are hard to find around here, so most of the things I bake with rhubarb end up looking, well, NOT pink. But that doesn't mean non-pink rhubarb sweets are any less delicious. Take this rhubarb, almond and coriander tart - a combination of an almond-rich, cake-y tart 'crust', chopped rhubarb, and a sweet almond topping, spiked with ground coriander seeds that you use in both the crust and the topping. The recipe is from 小嶋ルミのフルーツのお菓子: 季節のジャムとコンポート、ケーキなど86品 ('Rumi Kojima's Fruit Treats') (Shibata Shoten, 2014) (in Japanese). Rumi Kojima is a well-respected Japanese pastry chef and baking book author who runs a pastry shop called Oven Mitten in the west of Tokyo. A good friend of mine sent me this recipe, saying that she thought I'd like this - and she proved to be absolutely right (thanks!! x). Other than the fact that this is one of the few rhubarb recipes you see here in Japan (save for jams), it is also pretty special in that it uses coriander seeds with rhubarb. I'm sure there are recipes that do just that, but this was my first time trying this particular combination and I was delighted to find that it worked beautifully. Because I used a tart pan that wasn't the size specified in the recipe, the tart came out thicker than it should be - but it was still really very tasty. While I don't terribly mind my rhubarb things dull green, when I do want to make them pinkish, I do a bit of tweaking. Sometimes I just use redder parts of the stalks. Other times, I cook it with some decidedly red fruit, to 'tint' the rhubarb pink. With these rhubarb pistachio tarts, I picked out bright red portions of the rhubarb stalks I had. I can't remember which recipe I used (this is what happens when you are trying to blog about something you made a few years ago... oops), but I think they were simple tart crust filled with a pistachio frangipane (namely, an almond cream made using pistachios instead of, or in this case, in addition to, almonds), and topped with lightly poached rhubarb. You can't really tell there are pistachios in these, but I think they were just fine. This was a nearly vegan version based on a recipe from かんたんお菓子: なつかしくてあたらしい、白崎茶会のオーガニックレシピ ('Simple Treats') (Wave Publishers, 2012) written by Hiroko Shirasaki (in Japanese). Starting with some decidedly green rhubarb, I poached it along with some strawberries and cranberries, as well as a bit of honey, and left it to infuse overnight. Meanwhile, for these rhubarb brioche tarts, I used only red parts of rhubarb, AND paired it with a raspberry jam for a good measure. I love these simple 'tarts' using a brioche dough and fresh fruits. Shame the color didn't pop up so well but rather blended into the gorgeously browned brioche, and come to think of it, the brioches baked up perhaps a little too round to be called 'tarts'. Never mind. The brioche recipe I used was from 少しのイーストでゆっくり発酵パン　こんな方法があったんだ。おいしさ再発見！ ('Slow Rise Bread with a Little Yeast') by Masako Takahashi (Parco Publishing, 2007) (in Japanese). This is the book that helped me overcome my fear of baking with yeast and become able to actually enjoy making bread. Sugared brioche tart with rhubarb, apple, and raspberries. A butter-rich brioche dough is covered with some creme fraiche and dots of butter, topped with vanilla-sugared fruits, then dusted with some more of the sugar. The recipe uses only rhubarb, but I added some sliced apple and crashed raspberries. Because this brioche dough needs to be left to proof only once, the tart can be put together fairly quickly, which is a bonus for a treat that looks gorgeous and tastes great like this. And then, I made something else where I 'colored' my rhubarb with raspberries. Rhubarb, mascarpone and hazelnut tartlets. Shortcrust pastry shells get baked, then filled with a mascarpone cheese and hazelnut cream, and topped with stewed rhubarb, to which I added a bit of raspberries, just enough to give the rhubarb a gorgeous color. I think I may have cooked the rhubarb a little longer than I should have, but the tarts tasted lovely all the same (phew!). The recipe is from What Katie Ate: Recipes and Other Bits and Bobs (UK ed.) (Collins, 2013), the talented photographer and blogger Katie Quinn Davies's first book; you can find it here as well. Rhubarb cream cheese tart. A tart crust, a cream cheese mixture, and rhubarb compote. I can't very well remember which recipe I used (again) (sorry...), but I think it was something like this. The thing is, again, I always wanted to make a tart like these, using pink, slim stalks of rhubarb. When I couldn't get hold of such specimens, I decided to go ahead anyway, using some non-pink slim stalks - and colored them in pink myself. I cooked my rhubarb in rose wine, with some hibiscus flowers thrown into it for a good measure, as the rose alone didn't seem to be enough to tame the greenness of the rhubarb. Considering how green it was indeed to begin with, I think it turned out fine. This brilliant idea of cooking rhubarb with hibiscus, by the way, was first introduced to me through this other rhubarb tart recipe: Simply called rhubarb tarts by baker and author Kim Boyce in her gem of a book Good to the Grain: Baking with Whole-Grain Flours (Stewart, Tabori, & Chang, 2010), there are a lot more to them, apart from their rustic but striking look; the sunny yellow tart dough made using cornmeal is one thing, and the crimson red rhubarb compote is another. The rhubarb hibiscus compote is the fruit cooked down, some of it to a puree-like state and other left chunky, with brown sugar and dried hibiscus flower. It doesn't matter how green your rhubarb is; the hibiscus takes care of it and paints everything in scarlet. The deep, dark brown sugar flavor complement the tart rhubarb and hibiscus very well too. I've been making the compote many times over, to go with yogurt or other things. But here, it fills the cornmeal-based tart crust to make these little galettes. The red and yellow make some really striking-looking tarts. It's been a while since I made these (back in 2012(! )), but thinking I might make some again one of these days. You can find the tart recipe, including the compote, here. I think I may have taken (and posted) too many photos of these tarts... couldn't resist! They are so pretty. While hibiscus wins the rhubarb-painting game hands down, there is one fruit that is around at the same time as rhubarb is and tastes really well paired with the latter, while giving it a pretty shade of pinky red. Strawberries! Rhubarb and strawberry go together like peanut butter and jelly, or chocolate and banana. When you stop and think about it, about a half of rhubarb recipes out there seem to use strawberries as well. The tart rhubarb and sweet strawberries are a match made in (spring baking) heaven. And! Strawberries are generous in sharing their color with any green rhubarb that goes with them. 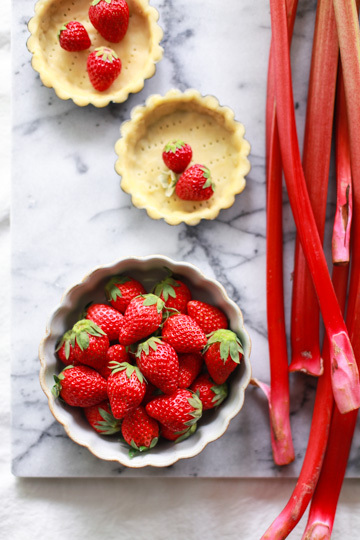 Take a simple strawberry and rhubarb tart like these. You cook rhubarb with just a bit of sugar, and when it's cooked through, remove from heat and add some fresh strawberries to it. While the mixture is still warm, serve it in pre-baked tart shells. Because the berries haven't been cooked through, you can enjoy the freshness of them in these tart, which I like. A simple, lovely affair. Recipe is here. This rhubarb and ricotta tart also pairs cooked rhubarb and fresh strawberries, in a different way. A sheet of puff pastry is spread with an almond cream, syrup-macerated rhubarb, and ricotta cheese. Once nicely baked up, cut into slices and served with vanilla ice cream and fresh strawberries. The recipe suggests you serve it with honeycomb as well, but that was something I didn't have knocking about, so I just used honey instead. Either way, you can't very well see the green of your rhubarb; in fact, you can't see much of rhubarb, green or otherwise. You can taste it, though, so that's fine. See? All nice and red/pink! But before the tart got baked? It is likely to have escaped your notice in the first picture, but the tart was covered with the dough cut into cherry blossoms shapes. I made this two years ago, thoroughly inspired by a picture I found on Instagram, of a "flower pie" like this one; isn't it just so pretty? I tried with sakura-shaped cookie cutters I had, but mine didn't turn out as pretty as I'd hoped. I suspect the cookie cutters could have been too large, or the tart pan too small. I could also have used more flower pieces, covering the surface of the tart more thoroughly. Apart from the topping, this was pretty straightforward kind of strawberry rhubarb tart; a shortcrust pastry, and a filling made of strawberries and rhubarb mixed with some sugar, cornstarch, cinnamon, and cardamom. And so, with spring comes sakura, both in a form of food and the real thing, on the trees. At around the end of March, you start seeing pictures of cherry blossoms posted by everyone in Tokyo and the west/south of the country. Here in the mountains of Nagano, it isn't until I have spent a few weeks feeling envious of everyone else that the blossoms finally start blooming. For us, it happens usually towards the end of April. We have a few cherry trees along our street up here, and while they aren't as extravagant as a lot of them you'd admire at the country's more famous sakura sights, we cherish them all the same. This spring I didn't go for hanami anywhere, nor did I made many sakura sweets as I had done in some other years. But I did try and make a sakura-themed flower tart - again. Taking into account the lesson I'd learned from my previous flower tart experiment, I made the tart in a larger pan, and increased the amount of cookie 'flowers' for the topping. Off it went in the oven... ...and it came out looking even less flowery than before (uuuuurgh). For all that mushy topping I got, I might as well hadn't stayed up late 'drawing' lines and dots on each of the cookie blossoms. Perhaps I should just use some other flower-shape cutter. Oh well. For those who are wondering, I used strawberries and apples for the filling, spiced lightly with cardamom and nutmeg. The crust was made using corn flour (i.e. very finely ground cornmeal), based loosely on this recipe. Hence a strawberry apple tart with cornmeal crust. It was, strictly speaking, a pie rather than a tart - but we don't quibble over trivialities, do we? Good. So, as you can see, strawberries have a very important role to play in spring fruit baking, either together with other fruits or on their own. I've mentioned this countless times, but over the past few decades strawberries seem to have turned into a winter fruit in Japan, judging by their appearances at grocery stores nationwide. Still, here in Nagano the locally-grown kinds don't arrive until March, and they last through June (or sometimes August). But that doesn't mean I'm averse to baking with apples in the dead of winter and early spring. In fact, here in Nagano where everyone seems to either grow apples on their own or receive a whole bunch from folks who do, we often find ourselves left with more apples than we know what to do with; so I've got to bake, and things like these apple and strawberry tarts can turn some of your dull apples into something delightful. You make a buttery, flaky tart dough, roll it out, top the rounds with thinly sliced apple and strawberries, dust them generously with sugar, and pop them in the oven. A very simple one that lets the flavor of your fruits shine, accentuated by butter and sugar. You can find the recipe here. Sakura and berry tarts. I made these when cherry blossoms were around, and here I actually used cherry blossoms to flavor the tarts. I didn't follow any particular recipe but just used what I had around and went with it. Namely: a graham cracker crust; a mixture of pureed strawberries, peaches (in syrup - the last of those I'd made in the previous autumn), and heavy cream set with a bit of gelatin, for the filling; and for the topping, whipped heavy cream flavored with some of the puree from the filling. I wish I could say these tasted as good as they looked pretty, but alas, not really. Funny how, a lot of times, something you make halfheartedly tends to taste, well, halfhearted? This was one of such instances, but they tasted ok enough. And oh, where is sakura, you ask? I scattered some freeze-dried cherry blossom flakes (yes, there is such a thing in Japan) over the finished tarts. You can't see them in the pictures, but they were there. Another no-recipe strawberry tart - but this time, one that actually tasted good. Simple strawberry and cream tartlets. I baked up some leftover dough and filled them with a mixture of mascarpone and whipped heavy cream. and topped with sliced strawberries. This is a type of tarts I often make when I have an abundance of fresh fruits in season - hard to go wrong with something this simple, as long as you've got good ingredients to start with. And now this one, I actually do remember what recipe I used! Strawberry pistachio tart. When I saw the photo for the recipe, I knew I had to make it. And luckily for me, it was a(nohter) simple one to make. You grind some pistachios and sugar in a food processor (or, if you don't have one like me, a sturdy blender(!) and a bit of patience do the job), sprinkle it all over a sheet of store-bought puff pastry, and bake in the oven. When it's done, arrange sliced fresh strawberries and chopped pistachios on top. This is a true showstopper - and tastes great too! A wonderful one to showcase the good fresh berries. Another reason I may want to bake with strawberries: when I've found a recipe that I just HAVE to try. I was positively smitten with the photo of these mini strawberry tarte tatins when I first saw it in donna hay magazine (issue #60, Dec/Jan 2012), and was determined to try my hand at them, even if I don't particularly like cooked strawberries. Or tarte tatins, for that matter. As you probably know, an authentic tarte tatin is made with apples. Yet you find a lot of non-apple variations these days. This particular version is one of the simplest you can do, as you don't have to cook the fruit before the final baking, and just use store-bought puff pastry. That said, I happened to have some homemade puff pastry (rough puff) around, so that was what I used. When you turn out the baked tatins onto a plate, a flood of caramel, now mixed with strawberry juice, comes out and you'd want to save as much of it as you can collect, to serve alongside the tarts, which are buttery, juicy, and caramel-y all at once. A bliss! You can find the recipe online, here - and can you tell I tried valiantly to mimic the styling up there? A gorgeous one to look at, and a lovely one to eat. And I was left with a LOT of strawberry caramel after the tarte tatins, and it was so good there was no way I could just throw it away. So I used it to make yet another strawberry tart. Strawberry caramel cheesecake tart. It probably sounds over-the-top, but man, it was SO good. You can't see it in here, but the goodness that is a strawberry caramel is hidden beneath the cream cheese filling. ...Well, turned out, we still couldn't see the caramel even when I cut the tart into slices. In fact, the caramel I'd spread over the crust mostly seeped into the cream cheese filling and got indistinguishable. BUT you could still taste the caramel, and as I just said, it was SO GOOD. I loosely followed this recipe for the cookie crumb crust and the filling, using things I had around. I definitely won't mind making it again, if only I could recreate the exact thing! Meanwhile, come May the mountains become greener by day, quite literally. I shot this in the beginning of May this year. It's not an exaggeration to say that, this time in the season, the leaves on the trees would be larger this morning than they had been yesterday afternoon, and would be still more so by this afternoon. The light can feel almost summerlike, but it's still on the cool side of warm up here. Ten days later, our corner of the woods were properly all green. By mid May, while still busy baking with strawberries and rhubarb, I'd start spotting some other fruits at the store. Like loquats, for instance. They aren't a fruit we get grown locally (they thrive in a warmer climate, I suppose), and it's not a particular favorite of mine in the first place. But still, they are one of the first stone fruits that arrive in the year, and when I spot the first loquats on the store shelves, it feels to me that summer is not too far off. I just said that the loquat isn't my favorite fruit, but in the last few years I came to realize that I tend to enjoy them cooked rather than eaten fresh. And even more importantly, I treasure their seeds more than the edible flesh; loquat seeds have an aroma that's strongly reminiscent of amaretto, just as apricot kernels do, without the fuss of cracking open the tough shell required with the latter. I've used loquat seeds to make a liqueur, and flavor things like custard and panna cotta, to an excellent result. So here I made loquat tarts, by infusing a mixture of cream and milk with a few loquat seeds (peeled and chopped) to make a custard, and poaching the loquat flesh in a syrup with some vanilla bean. As you can tell from the picture, I made the custard a little too thin to fit the purpose, but the tarts still tasted delicious and smelled deliciously sweet. Mangoes! Well, somehow I don't really see them as a stone fruit, and besides, they tend to be available all year round due to the fact that a vast majority of them you find here are imported from various parts of the world. But still, they are generally in season in late spring and summer, so there. Mango galettes. Baking mangoes wouldn't be the first thing I'd do with the fruit unless I got them on the cheap side, but roasted mangoes do have their own things going on, with their texture turning velvety and the sweetness even more pronounced. These are another one of simple tarts that take advantage of store-bought puff pastry and involve very little preparation. The recipe has you serve them with a berry cream, but here I just had them with vanilla ice cream. The warm tarts were lovely with cold ice cream. I wouldn't mind making them again if/when I've got a plenty of fresh mangoes around. Another one, with unbaked mangoes: Mango lime tart. A shortcrust pastry filled with lime-scented custard and topped with sliced mango cheeks. Recipe is from here. I think I made the crust a little too thick (a pitfall I fall into rather often), but the luscious mangoes and the fragrant cream were more than make up for it. Mangoes should be around throughout the summer, so I'm definitely planning on making some more tarts with them. Some 30 kinds of tarts, more than half of which use either rhubarb or strawberries. Or both. And both rhubarb and strawberries may be found well into early summer, so there might just be a few more coming. Rhubarb and cherry gingerbread tart. I made this a few years ago when the first-of-the-season bing cherries showed up. It was a galette-type tart using a dough that's been liberally spiced with ginger and nutmeg. Much like strawberries, cherries do an excellent job of tinting rhubarb. The original recipe is for a pear tart that I found in one of the back issues of donna hay magazine. Both cherries and rhubarb went really well with the spices, and the tart was no doubt tasty - but whatever you do, you couldn't help but feel it was a wintertime tart, with the strong gingerbread flavor that dominated the whole thing. Oh well. And so, this was the third installment of my 'fruit tarts to make now' series that I started last autumn (to be more precise, the idea started back in the summer of 2012(!)). Next up is the fourth and last of the tetralogy: summer. Now the summer is the season when the fresh fruits are most abundant, and I've already got a huge backlog of photos for summer fruits tarts that have accumulated over the course of three summers and counting. I dread a mere idea of putting them all together, but hopefully, I'll manage before the summer's end. Or thereabout. Perhaps. Lastly, my apologies for taking so long to finish up this spring post that I first posted at the end of May (which was already late for a 'spring' story). Thanks for putting up with me and my regrettable blogging habit and I hope to see you all here soon-ish...!